Air pressure is the pressure exerted by the weight of air above. Average air pressure at sea level is about 1 kilogram per square centimeter, or 14.7 pounds per square inch. Another way to define air pressure is that it is the force exerted against a surface by the continuous collision of gas molecules. The newton is the unit of force used by meteorologists to measure atmospheric pressure. A millibar (mb) equals 100 newtons per square meter. Standard sea-level pressure is 1013.25 millibars. Two instruments used to measure atmospheric pressure are the mercury barometer, where the height of a mercury column provides a measure of air pressure (standard atmospheric pressure at sea level equals 29.92 inches or 760 millimeters), and the aneroid barometer, which uses a partially evacuated metal chamber that changes shape as air pressure changes. The pressure at any given altitude is equal to the weight of the air above that point. Furthermore, the rate at which pressure decreases with altitude is much greater near Earth's surface. The "normal" decrease in pressure experienced with increased altitude is provided by the standard atmosphere, which depicts the idealized vertical distribution of atmospheric pressure. In calm air, the two factors that largely determine the amount of air pressure exerted by an air mass are temperature and humidity. A cold, dry air mass will produce higher surface pressures than a warm, humid air mass. 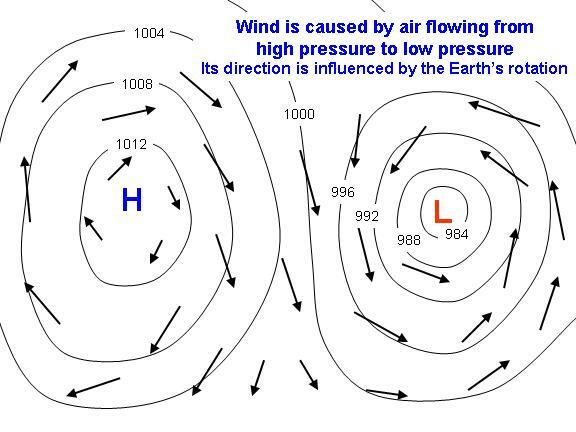 Wind is the result of horizontal differences in air pressure. If Earth did not rotate and there were no friction, air would flow directly from areas of higher pressure to areas of lower pressure. 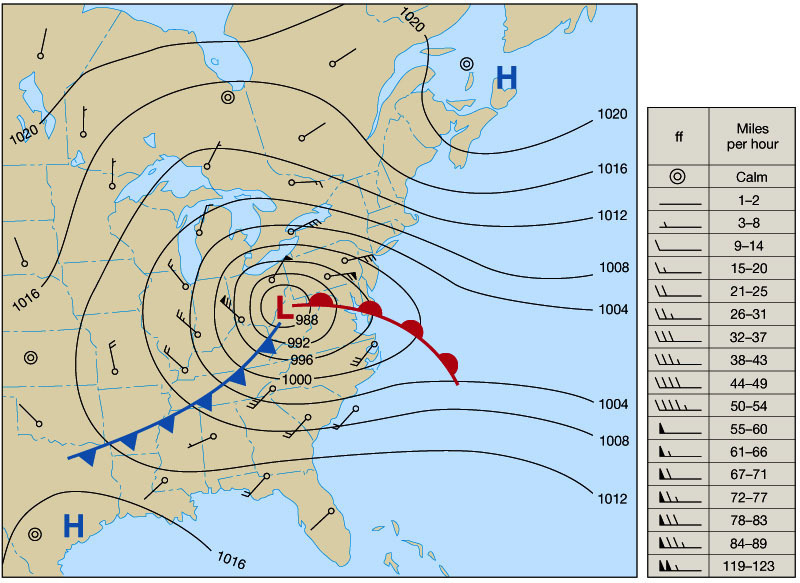 The pressure-gradient force is the primary driving force of wind that results from pressure changes that occur over a given distance, as depicted by the spacing of isobars, lines drawn on maps that connect places of equal air pressure. The spacing of isobars indicates the amount of pressure change occurring over a given distance, expressed as the pressure gradient. 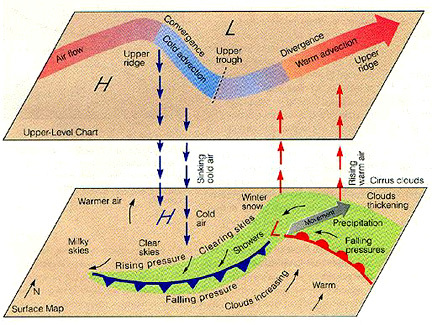 Closely spaced isobars indicate a steep pressure gradient and strong winds; widely spaced isobars indicate a weak pressure gradient and light winds. 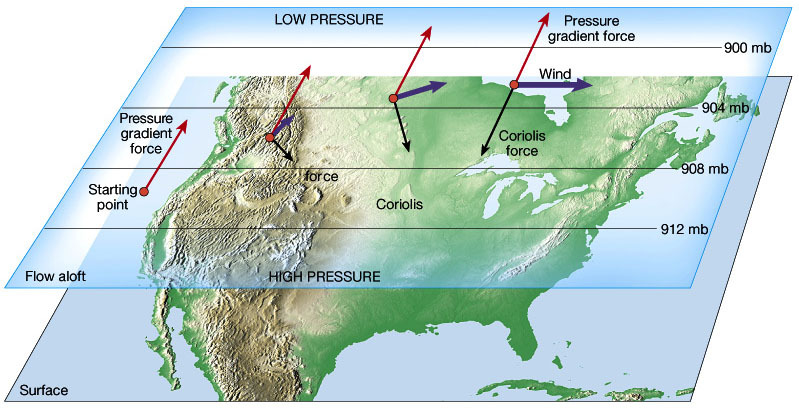 There is also an upward directed, vertical pressure gradient which is usually balanced by gravity in what is referred to as hydrostatic equilibrium. On those occasions when the gravitational force slightly exceeds the vertical pressure-gradient force, slow downward airflow results. 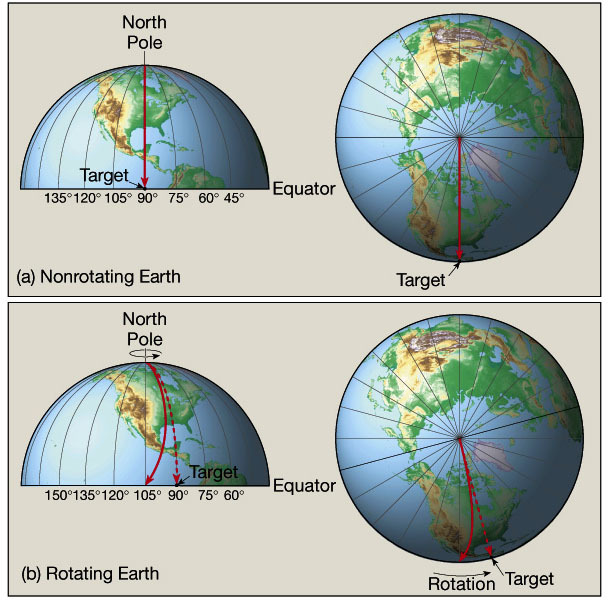 The Coriolis force produces a deviation in the path of wind due to Earth's rotation (to the right in the Northern Hemisphere and to the left in the Southern Hemisphere). The amount of deflection is greatest at the poles and decreases to zero at the equator. The amount of Coriolis deflection also increases with wind speed. Friction, which significantly influences airflow near Earth's surface, is negligible above a height of a few kilometers. Above a height of a few kilometers, the effect of friction on airflow is small enough to disregard. 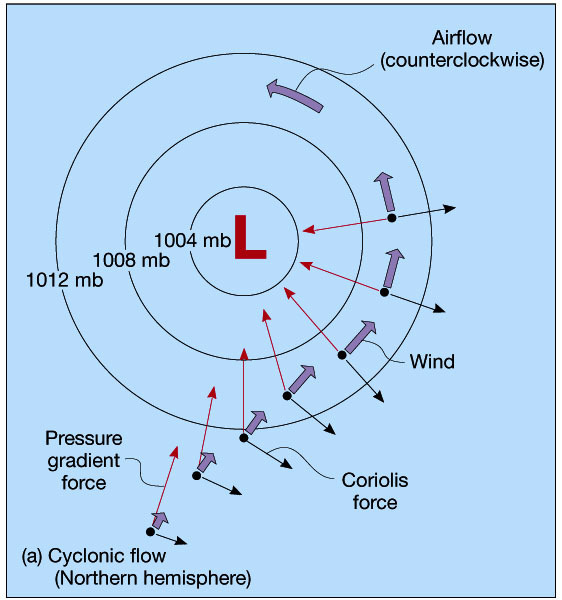 Here, as the wind speed increases, the deflection caused by the Coriolis force also increases. 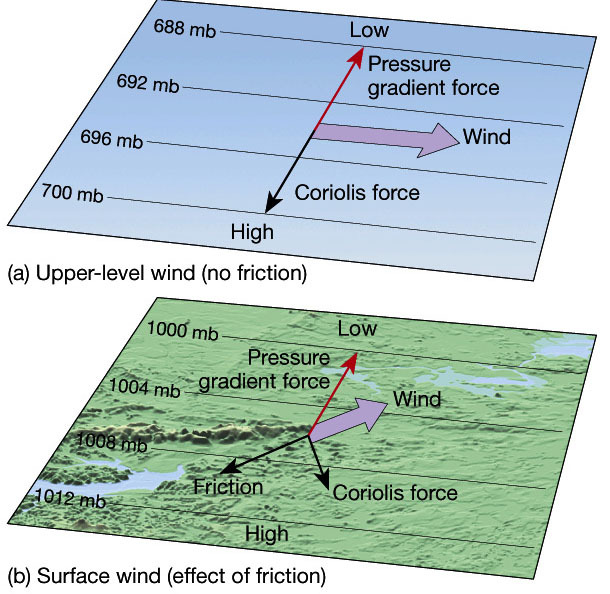 Winds in which the Coriolis force is exactly equal to and opposite the pressure-gradient force are called geostrophic winds. Geostrophic winds flow in a straight path, parallel to the isobars, with velocities proportional to the pressure-gradient force. is counterclockwise in the Northern Hemisphere and clockwise in the Southern Hemisphere. 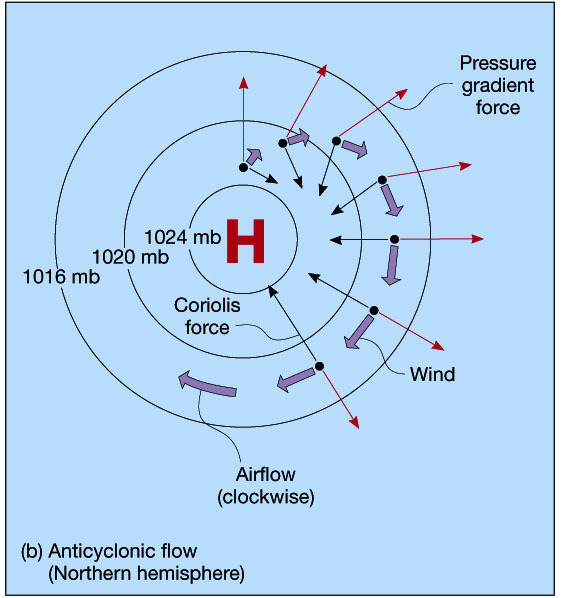 Centers of high pressure, called anticyclones, exhibit anticyclonic flow which is clockwise in the Northern Hemisphere and counterclockwise in the Southern Hemisphere. Whenever isobars curve to form elongated regions of low and high pressure, these areas are called troughs and ridges, respectively. toward the area of low pressure. Therefore, the resultant winds blow into and counterclockwise about a Northern Hemisphere surface cyclone. and a net outflow (divergence) around an anticyclone. 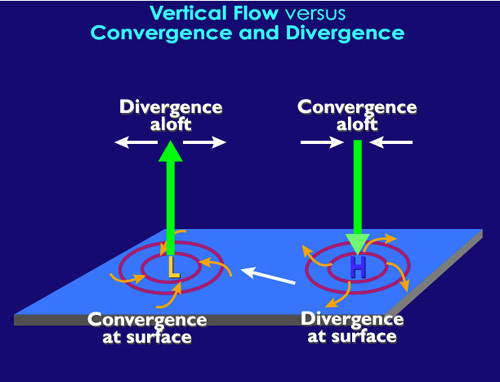 A surface low-pressure system with its associated horizontal convergence is maintained or intensified by divergence (spreading out) aloft. the passage of a low pressure center is often associated with stormy weather. By contrast, fair weather can usually be expected with the approach of a high-pressure system. (the nature of the change of the barometer over the past several hours) is useful in short-range weather prediction. 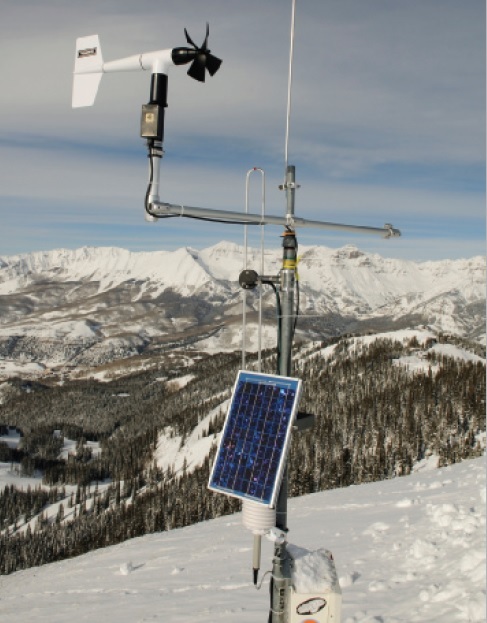 Two basic wind measurementsdirection and speedare important to the weather observer. Wind direction is commonly determined using a wind vane. When the wind consistently blows more often from one direction than from any another, it is called a prevailing wind. 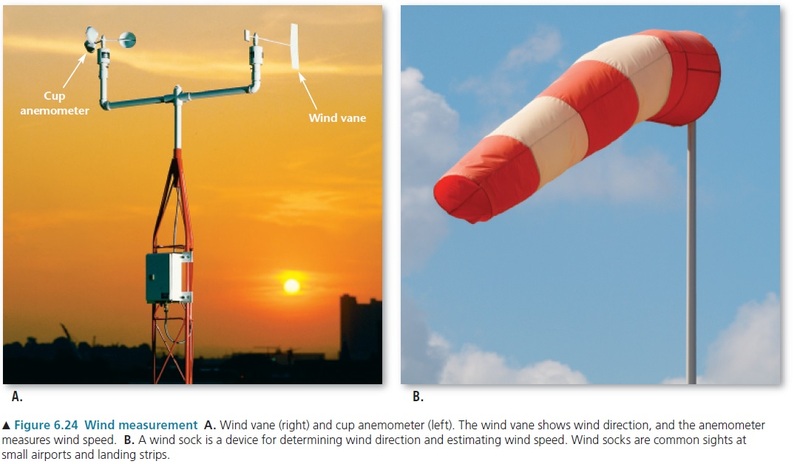 Wind speed is often measured with a cup anemometer.